There is possibly nothing more frightening then a treasured dog (or any pet) escaping from a kennel. I know this for a fact. My first dog was nothing if not an escape artist. My Dad left him at a Vets because I don't really know why-but obviously Wags was feeling better, he dug under the enclosure and the next thing I heard was my Dad yelling at the Vet over the phone. While he was still yelling there was a bark from outside--It was Wags!! He really was an exceptional dog who had been taught (by my Dad) to look both ways before he crossed roads. I don't know who made it down those stairs to let him in faster, my Dad or me. We did change Vets after that!! Well imagine going on a vacation and coming home only to find out that the cages on very expensive kennel where you had left your pet had been opened and all the pets had taken off. To make matters even worse--the owner of the kennel had been murdered! Kelly, with her fingers still crossed behind her back if only mentally promised Mike, her husband and the sheriff that she would not get involved. As it turns out there were four suspects----will the real killer be found? And of course all the recipes that Kelly prepares in the book can be found at the end of the book look really scrumptious!! The author has graciously offered once again to give 3 lucky people copies of this e-book--see below for the Rafflecopter form! They have plenty of suspects to choose from: the druggie kennel employee; the owner of the award winning Yorkie that was impregnated while staying at the kennel; the disgruntled head of the Pit Bull Sanctuary who was instructed by the owner of the kennel to get his pit bulls off of the property within twenty-four hours; the impoverished woman whose property is next to the luxurious kennel and is jealous of the dogs being boarded there; the kennel manager; and her husband who has anger issues. Will Mike and Kelly find the killer before the killer comes after them? And what about the dog named Skyy? Is she cute enough to make Mike rethink his decision to only have two dogs? Can she worm her way into his heart? I would be really worried if I returned to find the kennel emptied. The thing about a book featuring dogs for me is that I can't help but think there has to be a little dof fun in there somewhere too. Oooh, I do love a good mystery! This sounds like a fun book. I love Dianne Harman's books. 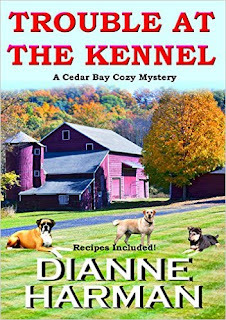 Thank you for the chance to win an ebook copy of Trouble At The Kennel. You totally peaked my interest! Looks like a great book. My dog was a little escape artist in his day. This sounds really good and I love love love that cover! 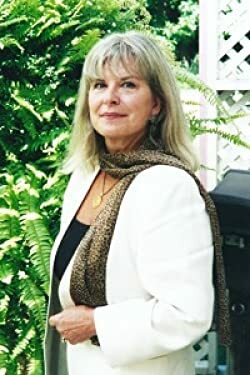 I'm working my way through the Cedar Bay series by this author. I already read Kelly's Koffee Shop and have Murder at Jade Cove to read. BTW: The link to follow the author by email isn't working for me. It says it can't be found. It sounds like a book that would be light but completely entertaining! It must be really hard to find out that the safe place you left your pets is not that safe at all. My sister loves a good mystery read, so will share this with her. I have not read any of her books at this time. I have left my dog at my vet's kennel, and we had no issues. My cousin will love this one. She LOVES mystery books. Hope I win! We never had our dogs in kennels, but did have one that loved to dig under the fence. One time she got over a mile away before a good Samaritan caught her and called our number on the tag! That's really cool that she includes all of the recipes in the back of the book. That is an added bonus to the plot and story. I have not had the opportunity to read her books. I have left my dogs at kennels before and have worried about them while I'm gone because they are my babys. I've been wanting to make up more time to read more mystery books. It's important to immerse oneself in certain interest. I've never had a pet myself but I know my friends have sometimes left theirs in the kennels and went on vacation. I would not want to do that to mine since they'll feel lonely. I have had many pets, and loved each and every one! Many years of enjoyment!